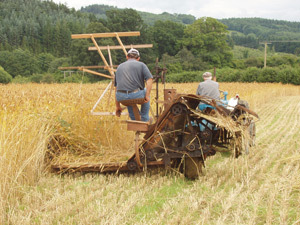 Thatchers Harvest, home grown Welsh Flour. 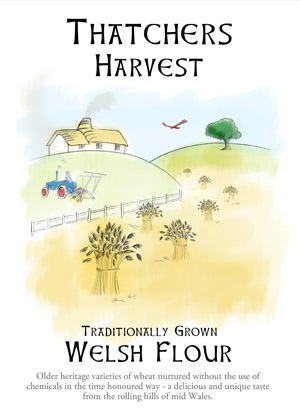 2014 sees the launch of our brand new Thatchers Harvest Welsh Flour. Made from older heritage varieties of wheat nurtured without the use of chemicals in the time honoured way - a delicious and unique taste from the rolling hills of mid Wales. 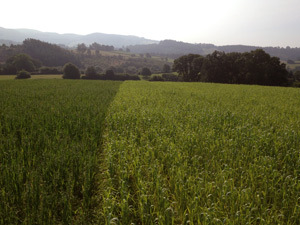 The grand launch is on Saturday the 24th of May in the Big Skill Craft Field attached to the Hay on Wye Literary Festival and will be a good opportunity for anyone interested to taste our bread made from what we call our tri perpoice wheat harvest grown near Builth Wells. 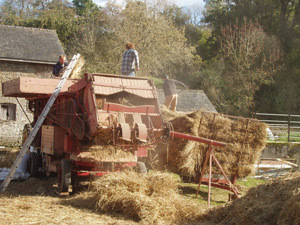 This year we have the variety 'April Bearded' from which we use the best straw for thatching traditional and historic welsh cottages, the waste combings going into straw bales for 'new age' building, and of course the grain is milled into flour for delicious bread and cakes. 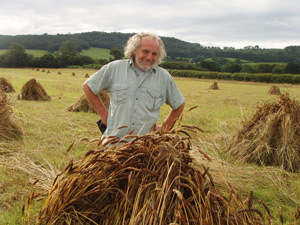 Farmer Graham Morris and myself Alan Jones have been working together for many years to develop wheat varieties that have the correct properties for thatching and also baking. After many trials we have now achieved or simply 'reintroduced' this practice which is perfectly sustainable as heritage or older variety's can thrive on poor soil and can contribute towards local economies and therefore community's. 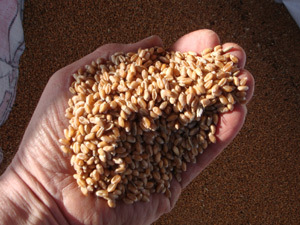 Heritage wheat varieties that where suitable for both food and shelter where abandoned in the 1940s when mechanisation and artificial fertilisers where introduced as a desperate measure to feed the nation, imperative at the time, however certain good practices where never reintroduced! So there is a willingness to encourage others to follow suit if this form of bio diversity appeals... We have a moderate supply of flour at present however if the gods are willing we have potential for larger quantities this Autumn of 2014, so fingers crossed for a bumper harvest and perhaps see you at the flour launch and craft fair? All sorts of wonderful crafts to look at and you can even have a go at thatching with Dafydd and I! 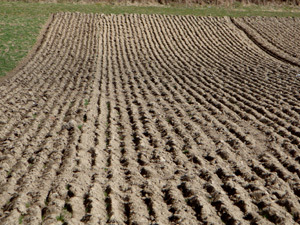 We farm 100 hectares which is all rented and I have farmed all my life. Being a mixed farm, we have always grown grain crops using a binder and threshing drum before moving on to a combine. In recent years we have been using a binder and threshing the grain as we have a large collection of vintage tractors and machinery. 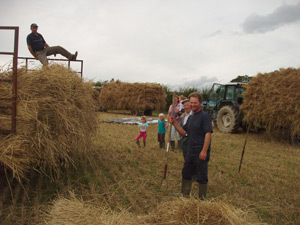 We also hold a vintage harvest working day and for this reason we began to grow thatching straw as we had been also growing oats for sheep feed and supplying sheaves of corn for a local smallholder's show at R.W.A.S. 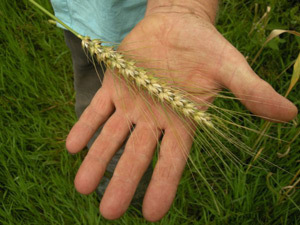 We now grow milling thatching wheat seriously and are expanding this side of our business as interest in traditionally grown milling wheat is very popular.